When you work with clients who are financing mobile, manufactured, and modular homes it can present some additional complications when qualifying and identifying which program will be the best fit for their scenario. However, there is no need to shy away from this segment of the market as many mortgage professionals have done over the years. There are several excellent program options available and becoming known as someone with solutions in this niche can lead to a steady stream of business. First off it will be important to determine what type of structure your borrower is buying or refinancing. Modular homes, which are manufactured in sections offsite, then transported to the home site, where construction is completed on a permanent foundation. These properties generally qualify for the same financing as stick-built homes, which are constructed on-site from the ground up. Mobile and manufactured homes are manufactured offsite on a permanently attached chassis and transported to the home site in one or more sections. These properties must be financed with programs that allow for manufactured homes within their guidelines. Where the home is located can be a factor that helps identify which mobile home mortgage option will be the best fit. Borrowers living in rural areas that qualify for USDA Rural Housing Loans may be able to take advantage of up to 100% financing by going this route. 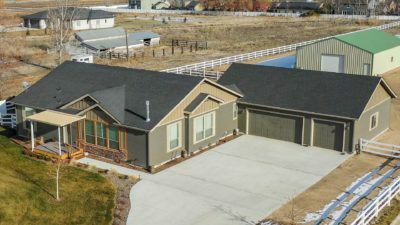 In order to be eligible, they must make enough money to afford the monthly payments (based on the criteria laid out in the USDA guidelines), but also have an income that falls below the current USDA Loan Limit for their location. Because USDA lending is intended to help those with low to moderate incomes become homeowners, these restrictions have been put in place. In addition, this solution is exclusively for new mobile homes. The USDA specifies that the home must be less than 12 months old and cannot have been previously occupied. When an application for a borrower with less than perfect credit crosses your desk, you might be concerned about whether you’ll be able to find any attractive options to offer them. Thankfully the FHA Manufactured Home Loan program can be a great fit even for those clients with a blemished credit history. Credit scores as low as 600 are considered, and the low down payment requirement is often very enticing to homebuyers and homeowners for whom credit is an issue. Qualifying veterans and active duty military personnel may be eligible for an excellent mobile home financing option – the VA Manufactured Home Loan. With this program it’s possible to purchase a new mobile home with zero down payment, making homeownership attainable even for those without a great deal of savings. This program is for financing a primary residence only, not for investors or those looking to buy a second home. Whether the property is a single wide, meaning it was transported in a single unit, or a larger home, that was delivered in two units (double wide) or three units (triple wide) and then joined together at the home site, can also impact qualification. The Fannie Mae Manufactured Home Loan and Freddie Mac Manufactured Home Financing can be great options for those double and triple wide homes, offering low mortgage rates and fees. Whichever option turns out to be the ideal fit for your borrowers we wish them all the best with their home!